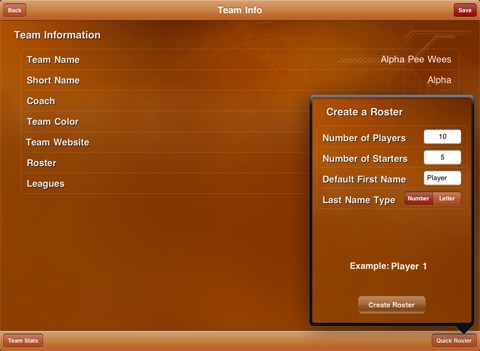 Pressing 'Create New Player' in the Player List screen or selecting a player from the Roster screen will take you to the Player Info screen. 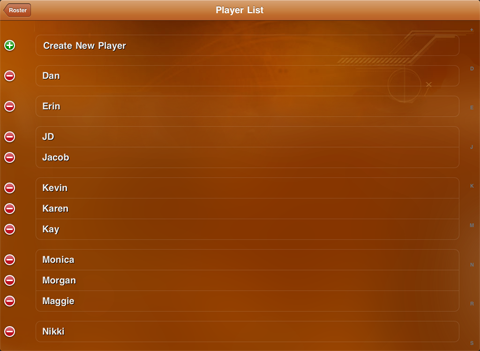 Here you can enter the name, number, height, weight and positions that the player plays. Put a checkmark next to each position that a player might play. 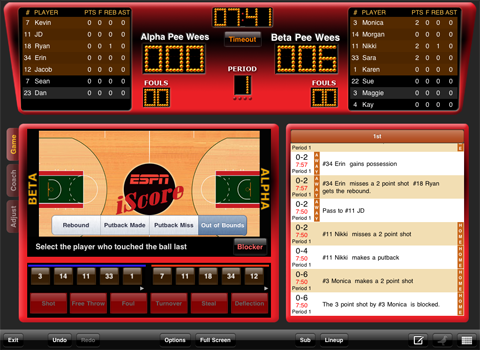 The main scoring screen is where the play entry occurs. If you need to rearrange your players or add new players before the game starts, press Lineup on the bottom bar. Switch between Home and Visitor teams using the toggle in the bottom left. Press the Options button in the lower right to swap home and visitor teams before the game has started or copy the players in the lineup back to the roster if the lineup has new players that you wish to include in the roster. Some people want to keep full player stats for their team but only record the score for the other team. This can be easily done but creating a single player on the other team named Team. Pressing Start Game on the court will start the game. 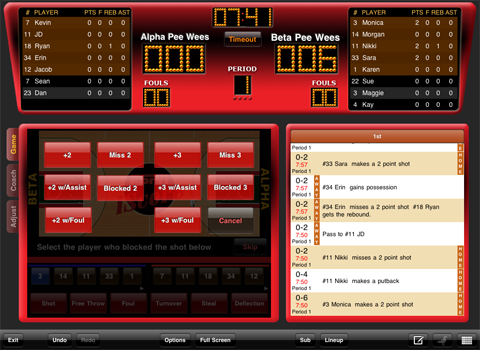 You will see the player buttons for the 5 players currently in the game for each team underneath the court. At game start time these will be the 5 players marked as Starting in the Lineup screen. After substitutions are made these will be the 5 players marked in the substitution screen. 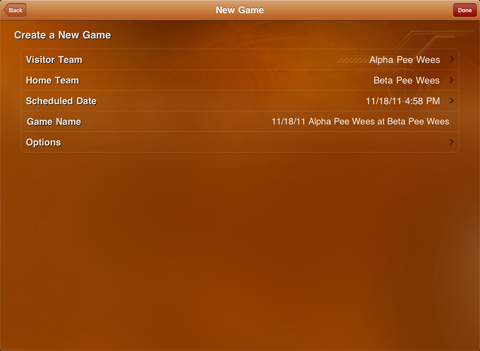 Notice that there are also arrows underneath the player buttons. These arrows indicate that there are additional player buttons which can be accessed by swiping to the left or right on the player button area. Normally you will use the five active players on each team to record stats but occasionally you may miss a substitution and having access to all the players at all times will help you keep up with the game. Notice also that the active players have a slightly brown tint, both on the player buttons and in the stats area above. Recording plays is very straightforward. Tap the button for the player making a play. 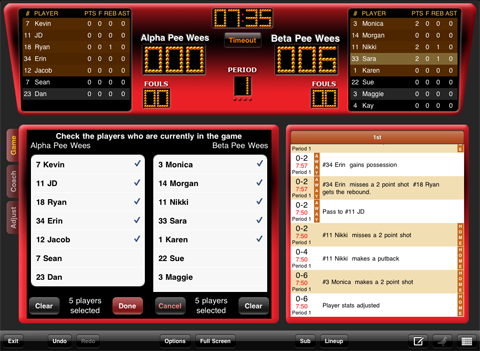 The selected player button will turn blue and the name of the player will be displayed below the court. For any shot attempt (made, missed, blocked, etc..) touch the spot on the court where the shot originated. If you don't wish to record the shot location you can alternately just press the Shot button. You will now see the various shot types. Choose from Made, Made with Assist, Made with Foul, Missed or Blocked. Besides shots, you can also record Free Throws, Fouls, Turnovers, Steals and Deflections. Simply touch the button for the player involved and then press the action button. 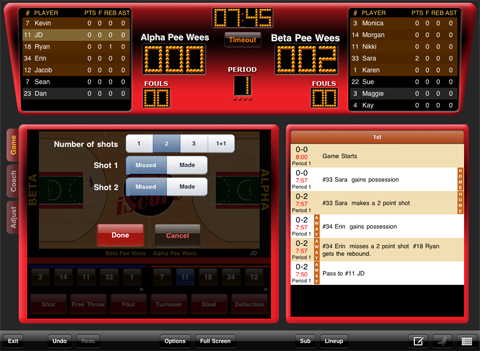 For example, after pressing the Free Throw action button you will be presented with the Free Throw options. Set the number of Free Throws and the result of each shot, then press Done. The clock can be paused and unpaused at any time by tapping on the clock. Double tapping on the clock brings up the clock adjust popup. Rotate the wheels to set the clock to the appropriate value. Full timeout tracking is available by tapping on the Timeout button. 30 second, Full and Media timeouts are available for both teams by tapping the top selector. Timeouts for each type and period are charted below along with full game totals. 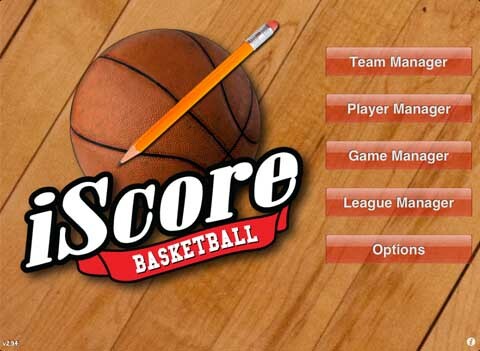 The score can be manually adjusted by double tapping on either the home or visitor scores. 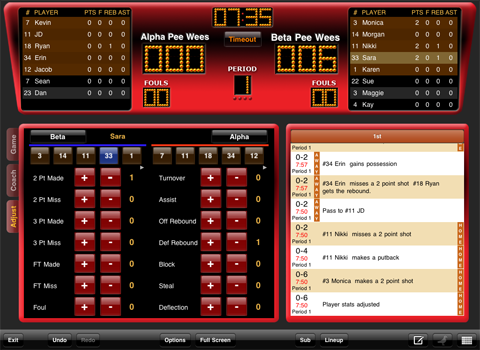 To the far left of the scoring area you will see three tabs labeled Game, Coach and Adjust. These three scoring modes allow you to choose the scoring method which best suits your needs. Game Mode has a unique design philosophy that is not found in any other stat tracking application. Game Mode is used to track the flow of a game, to present a full picture of how the game progresses and in doing so, provide a more complete and accurate statistical account. For this reason it is the best method to use when scorecasting because the scorecast viewers will get a complete picture of the action on the court rather than just the raw stats. When in Game Mode, as the ball is passed from player to player, tap the button of the player who receives the ball to indicate the new possession. 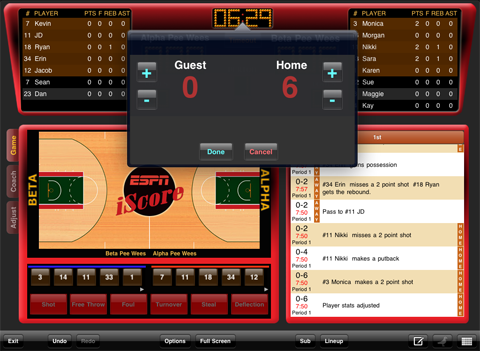 Even if there is no stat associated with the ball transfer, the transfer is recorded, the play by play shows the action and the scorecast viewers can follow the flow of the game. Think of the color commentary added by radio announcers to keep listeners informed of what is going on on the court. This is the same kind of extra detail that makes it more interesting for your fans to watch the iScorecast even though the events may not have statistical meaning. Tracking the game in this way has four advantages. First, it keeps you, as the scorekeeper, in the flow of the game. Rather than just waiting for something to happen and possibly getting distracted, your focus stays on the ball. Second, having the player already selected when an action occurs saves you the time it would take to search for both the player and the action simultaneously. If a player takes a shot, his button will have already been selected and you can simply touch the spot on the court where the shot occurred. Third, by capturing the flow of the game, additional information is recorded to explain each play. For example, on a steal, the player who had the ball will already be selected. You would then press Steal and select the player who stole the ball. The play by play and the scorecast will show not only who stole the ball but the player from whom the ball was stolen. The person who stole the ball will remain selected and additional actions can be applied to that player. Because both sides of the action are recorded, when the coach reviews the game at a later date, he will have a better sense of what needs to be addressed in practice. Fourth, Game Mode can guide you though the process of capturing the complete stats picture. Take for example a blocked three point shot that goes out of bounds. 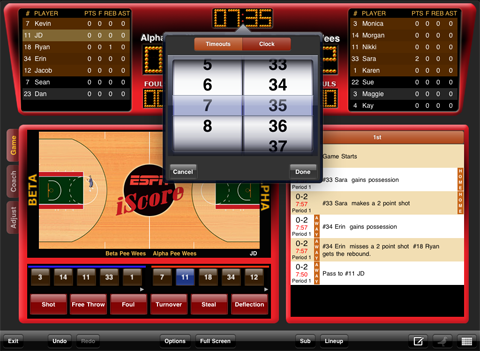 What stats should you enter using traditional scorekeeping methods? Would you know that the play generated three distinct stats, a block for the blocker, a missed 3pt attempt for the shooter and a Team offensive rebound for the shooter's team? Even knowing that, would you be able to quickly determine the sequence of steps to enter the information using traditional scoring methods. Because Game Mode tracks the flow of the game rather than focusing on the individual stats, it is able to guide you through the entire process to get the complete picture. Using Game Mode for the blocked 3pt example above, tap the location of the shot, select Blocked 3, iScore asks who blocked the shot, select the blocker, iScore asks what happened after the block. Select Out of Bounds and when asked who touched the ball last, press the Blocker button. 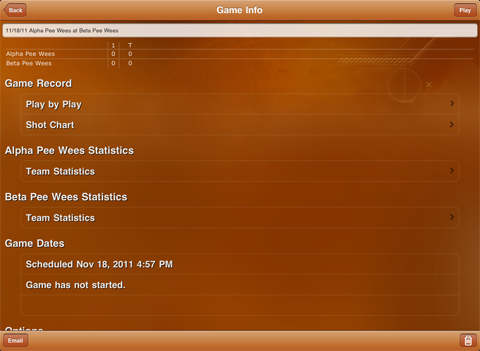 From this information, iScore generates the complete stats for you. So far we have shown how to record plays in Game Mode. 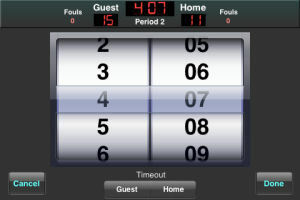 iScore Basketball also offers two other data entry modes, Coach and Adjust modes, which allow for more freeform data entry. 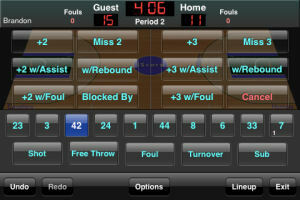 Touch the Coach tab to the left of the scoring area to put iScore into Coach mode. Coach mode focuses on recording only the stats that interest you. It is so named because a coach, from the sidelines, may not have time to record the entire game flow but he may want to record shots, rebounds, assists, etc for just his players or for both teams.To record a shot, touch the player who made the shot, touch down on the court and drag the shooter to the exact position where the shot was taken (saves time over tapping repeatedly to get the location just right), then press the button for the result of the shot. To record other types of actions, touch the player button and then touch the action button. 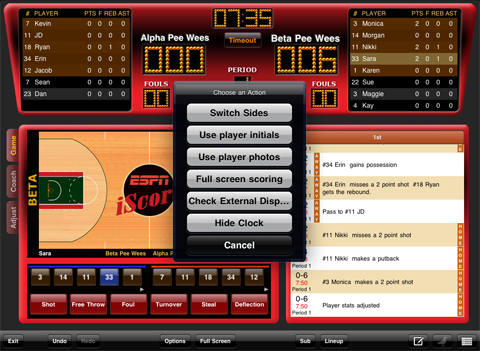 Some of the actions such as Free Throw or Foul will present you with an additional dialog where you can provide more information. 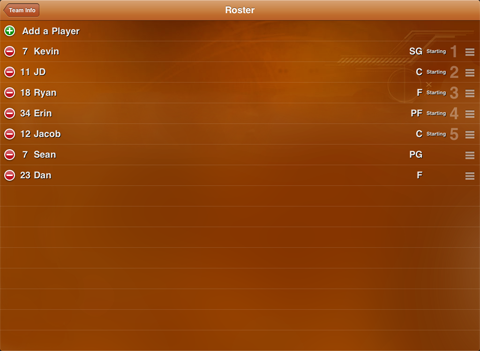 Notice that you can also scroll the player buttons in Coach mode up and down to access additional players on the team. Above the player buttons is a team button for each team. When a play occurs that requires a team rebound for example, touch the team button and then the rebound button. 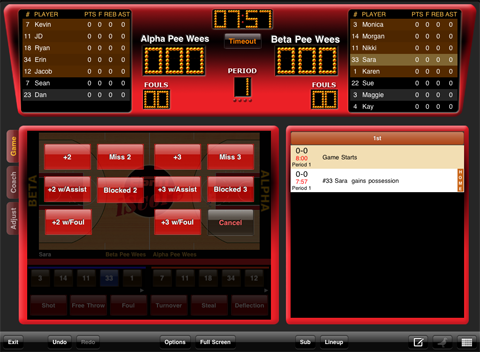 Coach mode can display the player names or player photos, depending on the Photo setting, accessed by touch the Options button. Touch the tab labeled Adjust to enter Adjust Mode. Adjust mode will let you add or subtract stats for any stat category. If you have purchased iScore after the start of the season you can enter you stats to date using Adjust Mode. Create a new game and for each of the players, use Adjust Mode to enter all of their stats totals for the season to that point. Substitutions are made by touching the Sub button on the bottom bar. Touching the Sub button brings up the substitution screen. Put a checkmark next to the 5 players on each team who will be active in the game. You can clear all of the checkmarks for either team by pressing the Clear button. 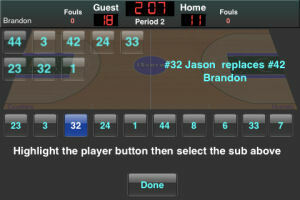 With iScore Basketball you can record as much or as little of the action as you want. When you first start scoring you will see that each team has from one to five player buttons depending on how many starters were set in the lineup. The numbers on the buttons correspond to the jersey numbers of the players. 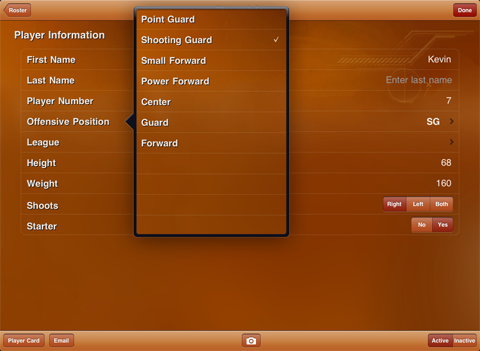 The key to performing any action in iScore Basketball is to select the player who currently has possession of the ball from the available player list buttons. Once you have selected a player button you will notice that several things occur. First you will see that the name of the selected player appears above the court, on the same side as the selected player's team. This will help reinforce that you have selected the correct player. Also, below the player buttons the action buttons now become active. Using these buttons you can now record all events in a game. Let's start by looking at what happens when a player takes a shot. There are several ways to indicate that a shot has been made. The most obvious is to touch the Shot button with a player button selected. However, when a shot is recorded in this way, no information about the location of the shot is recorded. 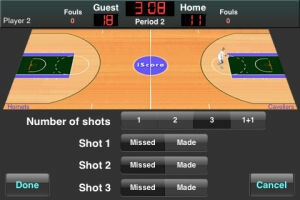 To record location information, with the player button selected, touch the spot on the court where the shot was made. The location will be recorded when you lift your finger so you can drag the player around as much as you want and lift your finger when the location is just right. The third way, which is just a shortcut to selecting the player button and touching Shot, is to double touch the player button. Using the double touch method will also not record any shot location information. After indicating that a player made a shot using one of the three methods, you will be presented with a selection of the possible outcomes of the shot. 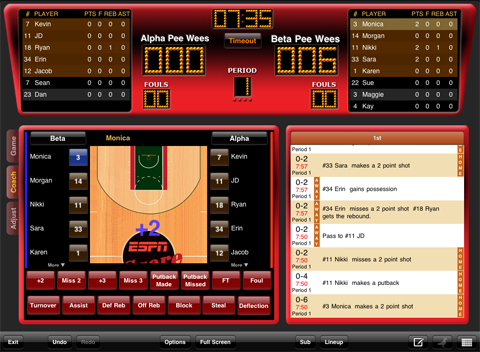 On the top row you will see options for the player making or missing a two or three point shot. Use these buttons if there was no additional action such as an assist or rebound on the shot. 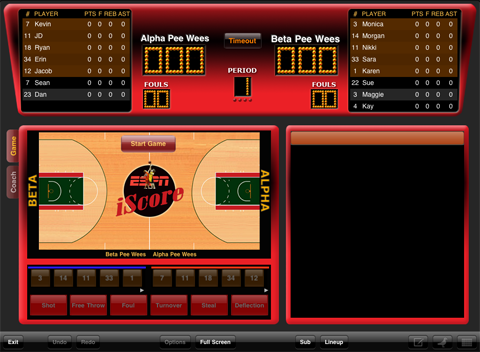 In the next row you will see options for made shots with assists and missed shots with rebounds. For example, if the player made a three point shot with an assist from another player, touch the +3 w/Assist button. If the player missed a two point shot and another player rebounded it, touch the w/Rebound button under the Miss 2 button. The third row allows you to indicate a made shot where there was also a foul on the shot (the foul button options will be available in version 1.1). If a shot was blocked by a defensive player you can indicate that by pressing the Blocked By button. You can also choose Cancel if you indicated a shot by mistake. When you select +2 w/Assist or +3 w/Assist you will be asked who on the offensive team made the assist. The players on the defensive team will be disabled. When you select w/Rebound under the Miss 2 or Miss 3 buttons you will be asked who made the rebound. Since any player can make a rebound, all of the buttons will be active. When you select the Blocked By button you will be asked who on the defensive team blocked the shot. The player buttons for the offensive team will be disabled. When you select +2 w/Foul or +3 w/Foul buttons you will be asked who on the defensive team committed the foul. The player buttons for the offensive team will be disabled. After selecting the player who made the foul, the free throw options will be shown. You can assign a foul by selecting the player who has possession of the ball when the foul was committed and touching the Foul button. You will then be presented with the choices for the foul. You can select either offensive or defensive fouls and personal or technical fouls at the top. Depending on your selection for defensive/offensive and personal/technical you can then select the type of foul committed. You can also select the player who committed the foul and the player who was fouled. When a defensive personal foul is committed, the player button will show the total defensive personal fouls committed by that player in the lower left hand corner of the button. The foul will also be added to the team fouls displayed at the top near the team scores. Team fouls are reset to 0 after each period. 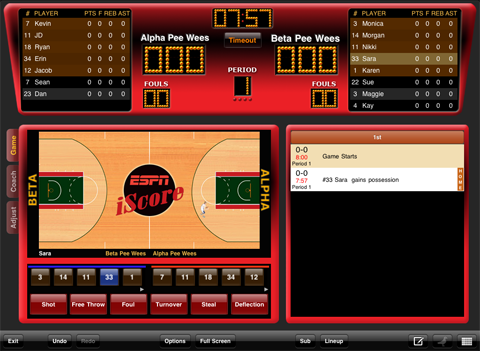 Player technical fouls are displayed in the lower right hand corner of the player buttons. You can perform a free throw at any time by selecting the player who will make the free throw and touching the Free Throw button. You will be presented with the choice of 1, 2 ,3 or 1+1 free throws. Assign Made or Missed for each. 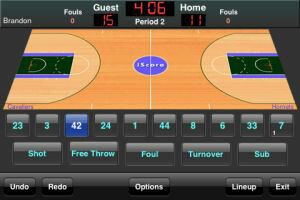 You can indicate a turnover by selecting the player who had possession of the ball when the turnover occurred and selecting the type of turnover from the choices displayed. Turnovers resulting from clock violations are shown at the bottom. If the turnover was a steal or interception, you will be asked who stole or intercepted the ball. Substitutions can be performed by selecting the player who will be substituted and then selecting the player who will replace him. Continue in this manner until all substitutions have been made, then touch Done. The clock can be paused at any time by touching it. Touching it again will restart the clock. Double touching the clock will bring up an interface that will allow you to adjust the time. You can also indicate a home or guest timeout. Remember that you can score as much or as little as you want. 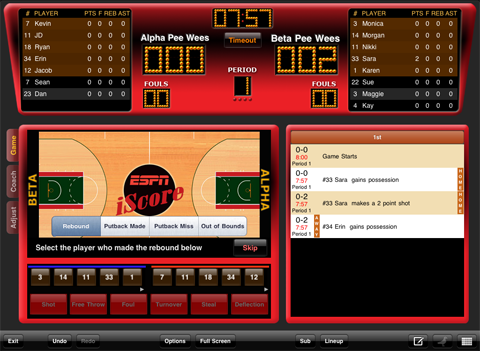 It can be as simple as double clicking the player button and selecting +2 or +3 for each basket made. From there you can record additional info as you become more comfortable with the interface.